In the event of a substantiated serious security or safety concern, either on University property or in the near vicinity of the campus, numerous and diligent efforts are made to advise members of the campus community. The University takes its duty seriously to inform students and campus community members of threatening situations and how they can best protect themselves from harm. Information related to crime-related and other potentially threatening situations is provided in an accurate and timely fashion for use by students and other University community members to reduce their chances of becoming victims. These notices will be issued as a means of a “Clery Timely Warning Notice” (CTWN) or a “Security Alert” (SA). Clery Timely Warning Notices are specifically related to compliance with the federal Clery Act, which requires colleges and universities to notify students and employees whenever there is a threat that a serious crime is ongoing or may be repeated--so that campus community members can protect themselves from harm. The Clery Act identifies specific crimes that require a timely warning notice to be issued, when crimes are reported to officials with significant responsibility for student and campus activities, campus safety, or the local police and the reported crime(s) are believed to have occurred on campus, in or on non-campus buildings or property, or on public property contiguous to the campus. The Clery Act does not define what is timely. However, the warning should be issued as soon as pertinent information is available, because the intent of a Clery timely warning is to alert the campus community of continuing threats, especially concerning safety, thereby enabling community members to protect themselves. Clery Act regulations do not specify what information should be included in a timely warning. However, the warning should include all information that would promote safety, because the intent of the warning is to enable members of the campus community to protect themselves. The issuing of a timely warning notice should be decided on a case-by-case basis in light of all of the facts surrounding a crime, including factors such as the nature of the crime, the continuing danger to the campus community and the possible risk of compromising law enforcement efforts. Generally, the warning will specify the type of reported crime, the time and location at which the reported crime occurred, and specific advice to the campus community regarding steps to take to avoid becoming a victim. Clery Timely Warning notices will be issued to students and employees upon confirmation of a significant emergency, dangerous situation, incident or crime, impacting the campus community and/or the surrounding area. Other methods deemed necessary that may be used in the information dissemination process. 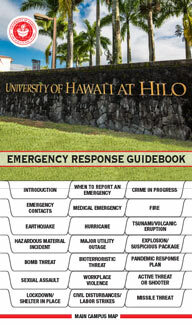 University of Hawaiʻi at Hilo uses a Security Alert System to notify students and employees when it is determined that there is a series of criminal activity, usually property crime related or other criminal activity that is not subject to the timely warning standard required by the Clery Act. The decision to issue a Clery Timely Warning Notice or a Security Alert is made in coordination and consultation between the Vice Chancellor of Administrative Affairs and the Director of Campus Security. In an extreme emergency, the notification process will be implemented at the sole direction of the Director of Campus Security or alternate.